Readers! We’re back with an updated, condensed version of our How To Readathon Guide (you can find the original version here) a few days before this winter’s edition of 24in48! Every ‘thon, we add hundreds of more readers than participated last time. With more prizes to win and places to participate than ever before, we’ve identified a commensurate need for some first timer guidance! Whether you’re totally new to the readathon or you’re a veteran looking to level up, these tips are for you! To be eligible for prize packs reserved for participants who read a full 24 hours, you’ll need to keep track of your time read. Every time you start reading hit start, and pause when you stop to take a break. Simple! It doesn’t have to be exact, but because this is on the honor system don’t abuse the clock (no letting it run while you nap, pals). Pro tip: Take a screenshot (esp. if you’re using your phone) every time you stop the clock, just in case you accidentally reset it. You can use multiple screenshots to prove your reading time if needed. Every three hours, a new post will publish on the blog, alternating between challenges and check-ins. The Hour 0 challenge will always be an intro survey, and the Hour 48 post will always be a closing survey. Challenges: every six hours (Hours 6, 12, 18, 24…), you’ll have the opportunity to do a fun little task (usually photo-based) to be entered for a prize. This year, we’re switching things up a little and having you submit your challenge entry through an embedded Google Form in the challenge post, rather than comment on the post itself. Check-ins: If you entered your info on the sign-up post, you’re automatically entered to win a random door prize as long as you’re actively participating on one of the platforms you listed in the sign-up form (i.e. Twitter or Instagram). The best way to keep up with these posts is to subscribe using the Follow button in the bottom right corner of the blog, which will push an email to you every time a new post is published. Often, the best way to complete the challenge is to take a photo and link it in the form answer box. You can do this by posting the photo to your social media platform of choice and dropping the link into the form (your entry won’t be counted unless it’s submitted through the form). For Instagram: click on the date of the post (see below) to go to a direct link to the image (https://www.instagram.com/p/BPnWz65AlBh/). Your account must be public (or the @24in48 insta account needs to be following you already) in order to enter. For Litsy: share a direct link to your post by clicking on the arrow at the bottom of the post and selecting how you want to share it (I usually email the link to myself in order to submit the form from my computer, but if you’re using your phone you can just copy and paste the link from you’ve shared it to and add it to the form). For the below post, this is the direct link: http://litsy.com/p/eGlZMm9PZGYw. IMPORTANT: Due to the number of participants, form submissions that only include a handle (i.e. @24in48) and directions to go look for the entry will not be eligible. You must include a direct link or the actual image. Pro tip: tagging all of your social posts with #24in48 to cheer on your fellow readathoners is great, but make sure your accounts are public (at least for this weekend) so others can cheer you on, too! 24in48 is a great way to connect with other readers across the bookternet (behind the scenes fact: it’s what brought all your hosts’ lives together #HeartEyesFaceForever). Even if your readathon weekend doesn’t contain much social media or regular check-ins (which is a perfectly fine way to participate), make sure you post something about the readathon when you start the weekend on one of the platforms you entered when you sign up so we know that you actually are participating. You’re still eligible for check-in prizes as long as we can see that you’re reading along. If you are staying away from social for the weekend, don’t forget to check the blog periodically (or at least once at the very end) to see if you won something during a check-in or challenge. Prize winners will be announced throughout the weekend, so scroll through all the posts to check for your name. As soon as you see that you’ve won a prize, hop on over to the prize page (which is being updated as prizes are added) and select your first, second, and third choices. If you live in the US, please do not select any of the international prizes unless that is all that is left. The sooner you claim your prize, the higher the likelihood you’ll get your first choice. The prize page will be updated periodically throughout the weekend so you’ll have a good idea of what’s still available. Pro tip: Make sure that the information you submit through the challenge forms is consistent with your sign up information; if we can’t find you, you’ll lose out. I hope this helps as you’re prepping for the ‘thon. 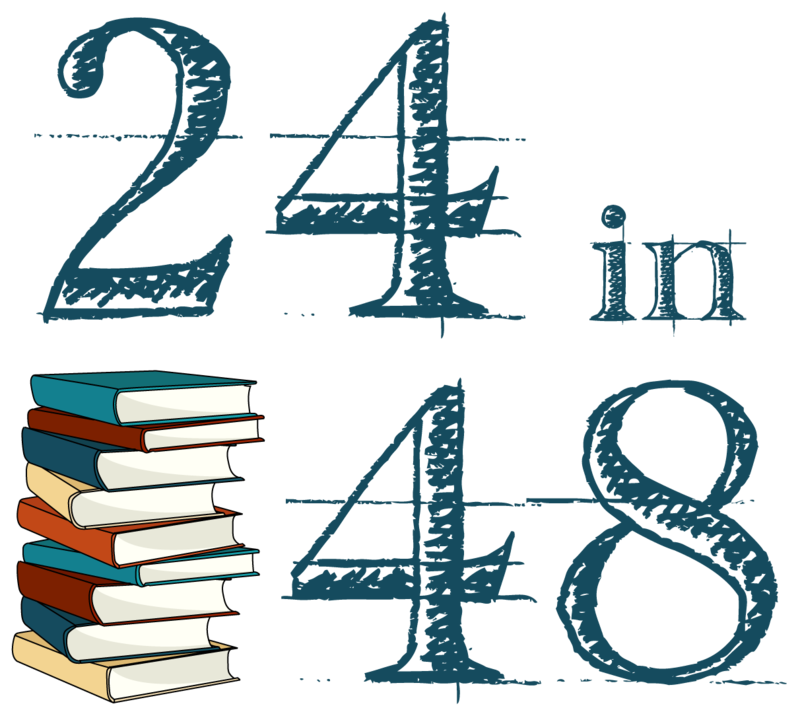 If you have any follow-up or additional questions, leave ’em in the comments below or Tweet us @24in48! I accidentally signed up twice for this, and I apologize in advance if it causes any problems. I didn’t get notification through e-mail the first time so I thought it hadn’t gone through. But I found I’m in the participants list twice. Just so you know.